Have you ever wondered what becomes of whales after they beach themselves or are washed up ashore, dead? Have you ever wondered what happens to their decomposing smelling giant bodies once the swarm of curious onlookers get bored and go away? To be honest, questions such as the ones I have shared here never crossed my mind either, in spite of the fact that I have read many a ‘dead whale washes ashore’ news stories and heard real life accounts from friends living around beach areas. But a visit to the Regional Museum of Natural History in Bhubaneswar not just triggered these questions but also provided answers to them. Just as I saw the skeleton of a huge toothed whale, pop went the questions – where did they get the skeleton from? Did they kill the whale and hauled it outside? Did it get caught in the fishing net? Was it dead already and so couldn’t swim away? What happens to the ones that get beached and die? And I got all the answers right away. Once the hullabaloo over the beached whale settles down, the dead specimen is taken over by the wildlife officials from where it is handed over to the Natural History Museums for research. The entire process of transferring the carcass to the museum location, cleaning it, studying it and making it ‘museum-ready’ is gory and long, and takes more than a year to complete. 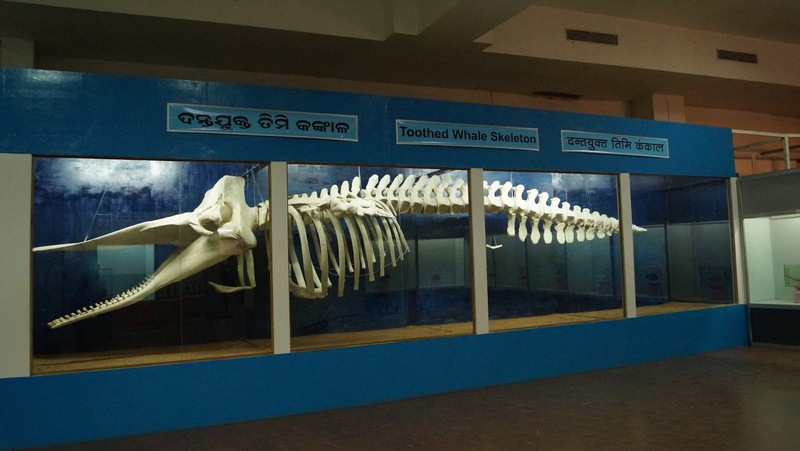 Bhubaneswar’s Regional Museum of Natural History has two whale skeletons- one of a toothed whale and the other of a baleen whale. Besides the many new things I learned here at the museum, the difference between various types of whales was the most engaging. Like the difference between a toothed whale and a baleen whale – toothed whales, as the name suggests, have teeth, whereas the baleen whales use the baleen system or baleen plates to filter out food from the water they gulp. One of the photos shows the baleen plates. Other than the two whale skeletons, the collection of exhibits at the museum is average. The place is filled with stuffed animals and reptiles displayed in jars, and there are some rhino skeletons too, but there’s hardly anything on plants and diverse ecosystem of the state. Besides the whale skeletons, the only other exhibit that got me curious was the preserved body of a pangolin – for am yet to see a pangolin for real, and this exhibit gave me an idea about to expect. How intriguing this species looks! Do check out the photos. While the number of exhibits in the Regional Museum of Natural History is limited, the museum complex is well maintained and looked after. Also, there’s no entry ticket and photography is allowed inside exhibit halls. While I enjoyed learning about whales and pangolin at the museum, wish they take measures to add more exhibits to their collection, for it would sure go a long way in enriching visitors’ curiosity about Odisha’s rich and diverse range of flora and fauna. Looks like an excellent museum. Good evening Madam, Very nicely described,looks like I m in the Museum n seeing all these u hv mentioned.I hv never been there,Now I hv decided I must see some days. Thanks a lot. My hometown museum. A museum I 've come to cross everyday on my way since so many years. So exhaustively you've dealt with this. Great write up. Thank you, Anupam. Glad you enjoyed the post and found it useful. Much like one of the museums we visited here in Washington DC…nice coverage for the enthusiasts.